Please check out Newest Released Temperature and Humidity Portable Data Loggers with LCD Display OM-HL-SH Series or OM-HL-SP Series for more advanced features with better price. 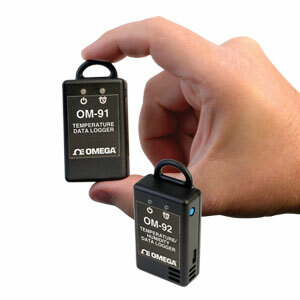 The OM-90 Series are portable, battery operated, temperature (OM-91) and temperature/humidity (OM-92) data loggers. The OM-90 Series data loggers offer accurate and repeatable logging for temperature and relative humidity. Temperature is measured to an accuracy of ±0.3°C over the range of 5 to 60°C (41 to 140°F) and ±2.0°C over the full range of -30 to 80°C (-22 to 176°F). Relative humidity is measured to an accuracy of ±3.0% RH over the 20 to 80% RH range and ±5.0% RH over the 0 to 100% RH range. Both temperature and relative humidity are logged at a user configurable logging rate which is software selectable. These data loggers are ideal for transportation applications where it is necessary to document that the material in-transit has stayed within particular environmental limits. High/low alarm limits can be set above or below which LED indicators will be activated so that the user can become aware that the desired transportation conditions have been exceeded. Each data logger can be assigned a 16 character name. This can be helpful in applications where multiple data loggers are used and there is a need to distinguish between them (for example based on location). The data logger includes a very easy to use software application. The application is used for configuration of the logger, extraction of logger data, graphically viewing data, spread sheet analysis of data and saving data to file (typically in comma separated value CSV file format) for third party applications such as Microsoft Excel. The graphical user interface is completely intuitive in terms of configuring new devices and extracting data from a field device. When the user has multiple devices requiring the same setup then a logger setup from a saved configuration file can be preloaded into the application to help expedite the process and ensure all loggers get setup identically. The application does not require any driver installations to connect to the data logger. Just install the software, run it and then connect the data logger. Note: Comes complete with 0.9 m (3.0') USB interface cable and 3V lithium battery.